In the article the analysis of causes for the decline in the quality of the casting, in particular, rail. It is due to mass not compliance with the requirements of the classical theory of metallurgical processes in the production of castings. Key words: Castings, quality, diffusion processes, three-dimensional processes, melting furnaces, classical technologies, metallurgical processes. Results of investigations of the mechanical characteristics of composites and casting alloys compositions Al–10%TiC, Al–5%Cu–10%TiC, АМ5–10%TiC, reinforcing phase comprising titanium carbide in particulate form ultrafine and nanosize. Key words: Composite alloy, reinforcement phase, titanium carbide, fluidity. The considerable part of defects of castings arises from low-quality development of the technological project. In the present article information on use of vacuum and film molding for production of castings of the increased quality is considered. When using the cores made by the VPF method it is possible to leave from the majority of defects of molding and shortcomings inherent at use of traditional cores. Use of this way allows: to use low cost of receiving high-quality molding; application of environmentally friendly foundry technologies; to realize high precision of the received castings; use of the container instead of a set of a molding; possibility of storage of forms in the container without vacuum;decrease in losses of forming sand and another. Key words: Defects of castings, steel, cast iron, form, polystyrene, vacuum filters, absorption, gas, decomposition, firmness of a form, fast knockout, high quality, analysis, decrease in marriage of castings. Shown is the possibility of using Al-containing slags recycling products at forming a ceramic shell for investment casting of Al alloys. Investigated are properties of ceramic shell with different variants of refractory dusting materials. Key words: Investment casting, ceramic shell, water-based binders, Al-containing slag, ecology. 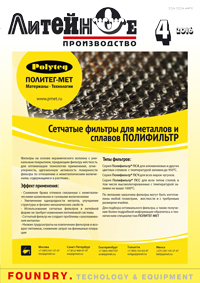 Presented are data on castings from composite materials with metallic matrix, in the production of which strengthening additions are used mainly in the form of special inserts from nonmetallic materials. When using the latter it is recommended to use pressure die casting or casting with crystallization under pressure. Key words: Castings, composite materials, casting with using pressure, technology, quality, properties. An analysis of the state and modern trends of foundry production development in China is given, castings productivity rates are compared with those of the leading European foundries and the experience on introduction of modern Laempe Coldbox-Amine coreshooting machines at chinese foundries is shown. Key words: Modernization of foundry production, modern core-production technologies, Coldbox- Amine-process.